A Norfolk fire station and the fire engine inside it have been completely destroyed by fire – because the building had no sprinkler system and no fire alarms. The Fire Service, which accepts it hadn’t followed its own fire safety advice, is now faced with a bill of about £1.5m to replace the station, with a further £250,000 needed to replace the fire engine. 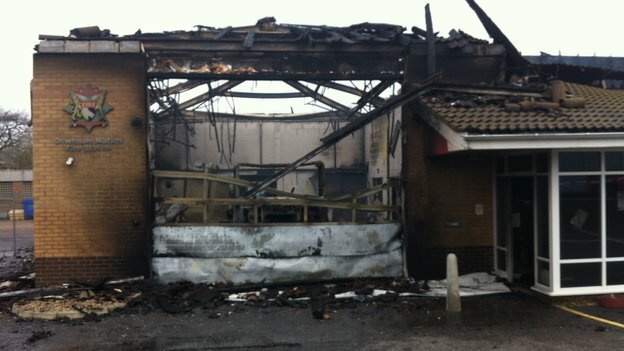 Eight fire engines from Norfolk and Cambridgeshire attended the blaze, in which no-one was hurt. A senior official at the Norfolk Fire Service acknowledged that the relatively-new building, in Downham Market, had been fitted with neither sprinklers nor alarms. If they had been present, the fire would have been put out very quickly, he said. He has asked other companies and organisations to see the incident as a warning about their own fire safety protection measures, suggesting that they should consider very strongly the installation of a sprinkler system and alarms. Norfolk County Councillor Dan Roper said the event was a timely reminder that no-one was immune when fire broke out. The experience of the Norfolk Fire Service certainly underlines the value of alarms and sprinkler systems. Automatic Fire Sprinklers Research of little benefit? Last week saw the publication of the first of three research projects on fire sprinklers commissioned by the Business Sprinkler Alliance (BSA). Bureau Veritas conducted the research with the objective of providing a “Technically Robust Insight” into the environmental and community benefits of installing fire sprinklers in single storey commercial and industrial premises compared to fires in equivalent non-sprinklered premises. The report focussed on comparing carbon emissions, water consumption, environmental and community impact. Are the results of the report convincing? There are so many caveats in the form of assumptions, estimates and vague extrapolations that the results are arguably not “Technically robust”? Even the authors state the results should be viewed with caution due to the limited data available for the study. The report only analysed data for premises in the range 50002ft -100002ft which accounts for only 2.5% of the relevant building stock as it could find no tangible benefits in smaller premises < 2000ft2 which account for over 90% of single storey commercial/industrial premises. The report did not place the calculated benefits in the context of total UK figures. If you accept the estimates given the 1800 tons of Co2 emissions savings over 30 years compares with the 500million tons of Co2 generated by the UK in 2010 alone. Similarly projected water savings of 25000 – 75000 cubic metres over 30 years compares to UK annual consumption of some 17billion cubic metres. The report includes input from the Environment Agency which classifies the impact of fires on water, land and air quality as minor or insignificant. As a distributor and supporter of the use of fire sprinklers I believe the benefits of automatic sprinklers are to protect life and property from the effects of fire and in the process help minimise fire damage and spread, provide added safety to fire fighters and offer round the clock protection. In specific cases where stored materials or working practices present a high fire risk either Insurers or legislation will drive the use of fire sprinklers. Otherwise it is a cost versus benefit choice. Will this report influence legislators or developers by claiming additional environmental benefits that are at best insignificant? This remains to be seen.